I am attaching complete set of photos from Sara Ella (Falls), here. One of the most remarkable things about the falls is that you can go inside the rock (a cave) and stay underneath the falls. Have a look at this picture, and you can see the cave with people underneath the falls. The cave is quite spacious and about 20 people can be accommodated there. It is a beautiful wall. I can imagine the view must be good to see from the inside of the cave. Thanks for sharing this beautiful waterfall with us. Your set of photos is wonderful. I would certainly like to visit wonderful place. WOW----I loved seeing all of the pictures... What a gorgeous place... Looks like somewhere that George and I would love to see. Hi Kiri, How do I get to this fall? Yes view was amazing from inside the cave. Get the feeling that you were caught to a never-ending torrential rain. Yep, both of you will love this place! In fact when I saw this falls for the first time in person, I remembered two of you. It is a lovely place. You have to come to Illukkumbura. (Kandy->Mathale->A9 towards Naula->Turn from Mandandawela to Right->Raththota->Illukkumbura). About 1 kilometre before Illukumbura Forest Dept (About 1km after Pitawalapathana) there is a turn to your left. This road will lead you to the falls. You have to travel about 8km on this road. Great captures!! I'm sure it was a memorable experience. Just curious: about how deep is the pool below the falls? 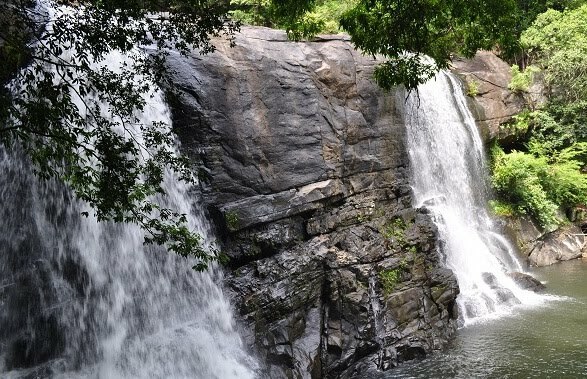 Beautiful falls Kirigalpoththa. I would enjoy being inside the cave too! The sound must be incredible. What a beautiful place...a cave behind a waterfall is absolutely fascineting. Thanks for the directions, Kiri! Didn't know we had a waterfall like that in SL. Seen falls with a cave behind in movies and cartoons and always wondered what it would be like :D. Must add this place to my bucket list! There are two people eying for this place now :) Yes caves behind waterfalls are fantastic. This is the second such place I have experienced. The pool just below the falls is about 7-8 feet deep, but the perimeter is shallower (around 4-6 feet). A fantastic natural swimming pool and we were there for hours. Yep, the sound of cascading water inside the cave is very refreshing. You'll surely love this place. Yep, I have seen a similar place before but this is a better place! That looks like it's a set for a fairytale movie. I love the shot with the cave, only there you can really tell how big the whole thing is. Beautiful waterfalls. I would love to be underneath it. Please, vote for me at my blog. Yes, the falls is quite big and the whole area is very spacious. A lovely place for a day out. Thanks and I will vote for you. A foto e o lugar são incríveis. that's pretty cool, I love it when I can go behind the waterfall too, we have very few of them here that we can watch the waterfall right from the back of it. Muito obrigado por seus comentários! Yes, such waterfalls are rare and if you get to see one that will be a great experience. lovely location and thanks for sharing it with us ! wonderful and so fine that you can go behind the falls. I remember sleeping in a place like this one time. Sooooooo gorgeous!! SL has so many fantastic waterfalls. Lucky you! Glad to see you back. The header idea came from this interesting site. You must! :) Thanks for your comments! Hi, you have good collection. I also have decided to visit there. One thing I have to say you, that is you have good eye. absolutely beautiful waterfall...... it's wonderful to see this as I am in the midst of very cold temperatures here in Texas. THANK YOU! Thanks a lot for your visit and for the comments. I would love to see that. It looks very peaceful! Must be wonderful under the falls. Yes it is a great place to explore.